A lean, ready-to-cook, boneless turkey joint that is an ideal alternative to a whole turkey to serve 3-4. Fresh British turkey butter basted breast joint and Fresh British turkey butter basted breast joint with sage and onion stuffing are available in Waitrose. Uses: Roast for a convenient alternative to a whole turkey. 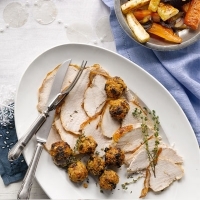 Serve with the traditional accompaniments to roast turkey , roast potatoes, stuffing, gravy, bread sauce, bacon rolls and a selection of vegetables. To store: Keep in the fridge in the original wrapping or in a covered container, below and away from cooked foods and any ready to eat food. Store until the use by date. To freeze, freeze on the day of purchase for up to 1 month. To defrost, remove from the original packaging and place on a plate or tray and cover. Defrost thoroughly in the bottom of the fridge, below and away from cooked foods and any ready to eat food, before cooking. Never re-freeze raw meat that has been frozen and then thawed. Wash work surfaces, chopping boards, utensils and hands thoroughly after touching raw poultry. To cook: Place in a roasting tin in the centre of a preheated oven at 190°C, gas mark 5 for 1 hour, until the juices run clear and there is no pink meat. Allow to stand for 5-10 minutes in a warm place before carving, this allows the joint to relax and will make carving easier. These are skinless, boneless thick slices of turkey breast. Uses: Turkey breast steaks can be left whole and pan-fried or grilled. To cook: To pan-fry, heat 1 tbsp oil in a frying pan and cook for 6-8 minutes, until turning occasionally, cook thoroughly until the juices run clear when pierced with a fork. To grill, lightly brush with melted butter or oil, place under a preheated medium grill for 6-8 minutes, turning occasionally, cook thoroughly until the juices run clear when pierced with a fork. 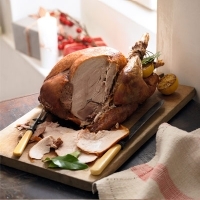 A range of different types of turkey are available seasonally at Waitrose, for full details check in store leaflets from October onwards. 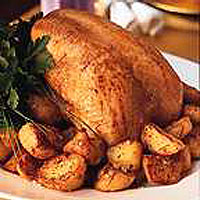 Uses: The most popular choice for Christmas dinner, roast turkey along with the traditional accompaniments of stuffing, cranberry sauce, roast potatoes, sprouts and bread sauce is considered by many to be the most important meal of the year. There are also a range of recipes from turkey curry to turkey risotto that mean you can make the most of any leftover meat. 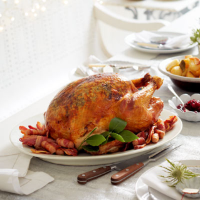 To prepare: Weigh the turkey (with stuffing if using), for a turkey under 4.5kg, allow 40 mins plus 15 mins.For a turkey weighing between 4.5kg and 6.5kg, allow 35 minutes per kg. For a turkey over 6.5kg, allow 30 minutes per kg. Place the turkey in a roasting tin and brush the breast and legs generously with butter and season well with salt and freshly ground black pepper. Place a piece of foil over the breast and legs. To cook: Preheat the oven to 160°C Fan / 180°C Electric / Gas mark 4. Roast the turkey for the calculated time and baste with the pan juices every hour. Half an hour before the end of the cooking time, remove the foil and cover the breast with overlapping bacon rashers. 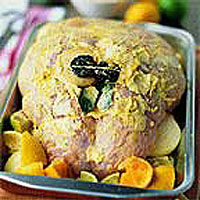 Return the turkey to the oven to finish cooking, cook thoroughly until the juices run clear when pierced with a fork. Transfer the cooked turkey to a platter and cover closely with a large sheet of foil to rest for 15-30 minutes, this helps to firm up the flesh and makes carving much easier. Use the turkey juices left in the roasting tin to make the gravy.